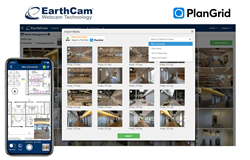 Today at the PlanGrid Construction Summit, EarthCam, the leading provider of construction camera technology, announced the newest feature set for its continued integration with PlanGrid. Building upon its existing integration, EarthCam’s Control Center 8 software-as-a-service (SaaS) now allows users to retrieve and import important progress photos from their PlanGrid projects. Project managers will benefit from the ability to collect all progress images captured by users company-wide for easy and efficient content management. PlanGrid images can be combined with EarthCam webcam imagery, 360° photography and drone content, creating one unified location for image organization and management. Users will receive all the benefits of the Control Center 8 SaaS, such as tagging photos, including them in PDF reports and even creating an animated guided tour that will virtually walk the viewer through the jobsite for a comprehensive overview of project progress. Additional features launched today include photo filters and image comparison tools. Used in conjunction with EarthCam’s extensive mark-up tools, clients have multiple options for highlighting specific areas of interest on the photos. Further insight is provided via jobsite environmental data being collected by EarthCam’s camera sensors. This latest phase of EarthCam’s integration also provides mobile support via its apps for iOS and Android devices, enabling project team members to collaborate remotely from any location. EarthCam was the first webcam technology company to integrate with PlanGrid and is the only integration partner delivering high-quality 360° photos for an immersive VR experience. One 360° photo viewing all four walls, floor and ceiling provides as much information as eight separate photos, making this efficient imaging technology a smarter way to communicate interior progress while creating a historic record of as-built conditions for future maintenance. Combined with EarthCam’s professional line of live streaming video cameras, time-lapse construction cameras and drone imagery, the valuable visual content is easy to analyze and is driving productivity for a more informative jobsite. 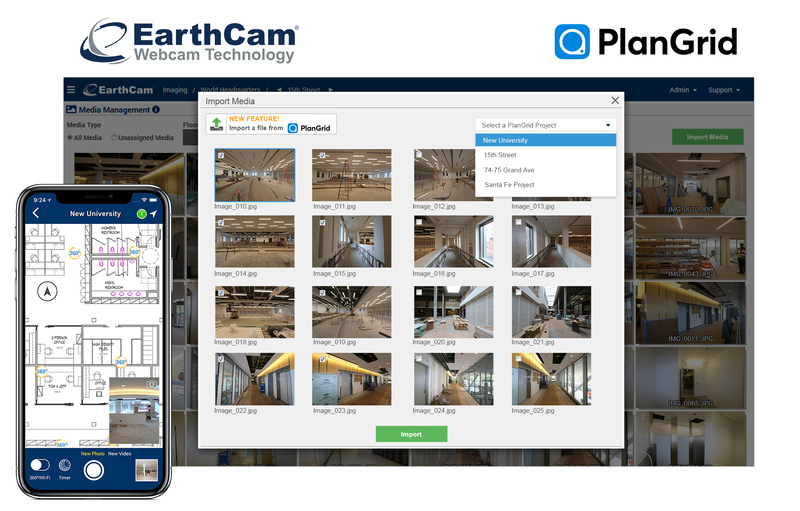 To learn more about EarthCam’s integration with PlanGrid, visit http://www.earthcam.net/plangrid. EarthCam is the global leader in providing webcam content, technology and services. Founded in 1996, EarthCam provides live streaming video, time-lapse construction cameras and photography documentation for corporate and government clients in major cities around the world. EarthCam leads the industry with the highest resolution imagery available, including the world’s first outdoor gigapixel panorama camera system. This patent-pending technology delivers superior multi-billion pixel clarity for monitoring and archiving important projects and events across the globe. In 2017, EarthCam documented $257 billion of construction projects. The company is headquartered on a 10-acre campus in Northern New Jersey and maintains 13 additional offices worldwide. EarthCam’s Control Center 8 software-as-a-service (SaaS) now allows users to retrieve and import important progress photos from their PlanGrid projects.